Taximaimaiti, R., Abudujilile, D., Maihemuti, M., Abuliken, X., Abudulimu, H. (2018). Retracted: Expression of AMHR2 and C-KIT in Cervical Lesions in Uyghur Women of Xinjiang, China [Retracted]. 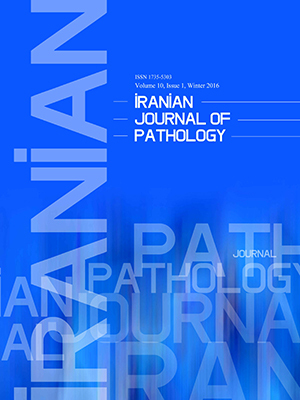 Iranian Journal of Pathology, (), -. Reyisha Taximaimaiti; Dilinuer Abudujilile; Muzhapaer Maihemuti; Xiekelai Abuliken; Haimiti Abudulimu. "Retracted: Expression of AMHR2 and C-KIT in Cervical Lesions in Uyghur Women of Xinjiang, China [Retracted]". Iranian Journal of Pathology, , , 2018, -. Taximaimaiti, R., Abudujilile, D., Maihemuti, M., Abuliken, X., Abudulimu, H. (2018). 'Retracted: Expression of AMHR2 and C-KIT in Cervical Lesions in Uyghur Women of Xinjiang, China [Retracted]', Iranian Journal of Pathology, (), pp. -. Taximaimaiti, R., Abudujilile, D., Maihemuti, M., Abuliken, X., Abudulimu, H. Retracted: Expression of AMHR2 and C-KIT in Cervical Lesions in Uyghur Women of Xinjiang, China [Retracted]. Iranian Journal of Pathology, 2018; (): -. The present article is retracted due to duplication. [Retracted] Background & objective: Cervical cancer is one of the most common malignant tumors in women. AMHR2 and C-Kit were two members of protein kinase which was reported in some cancers like ovarian carcinoma and breast cancer. The aim of this study was to examine and compare the expression of AMHR2 and c-Kit in cervical cancer and cervicitis section preparations. Methods: Polymerase chain reaction (PCR) and immunohistochemical staining were used to detect AMHR2 and c-Kit’s expression in cervical cancer and cervicitis samples from Uyghur women who had been infected with human papilloma virus (HPV)16. The expression rate was compared between cervical cancers of low, intermediate and high differentiation and cervicitis. Results: AMHR2 expression was lessen with the lower of differentiation degree of cervical cancer (p<0.05). While c-Kit’s expression increased with the reduction of cervical cancer’s differentiation degree (p<0.05).